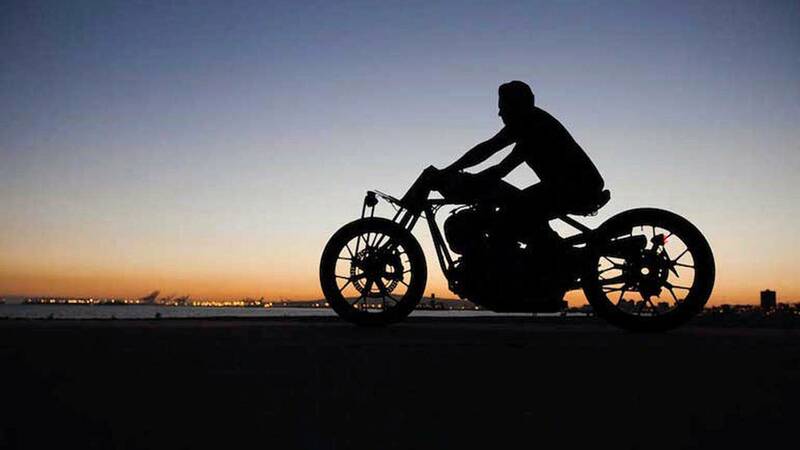 We’ve featured the work of our friend Roland Sands here on RideApart quite a bit in the past, and for good reason: his stuff is awesome. 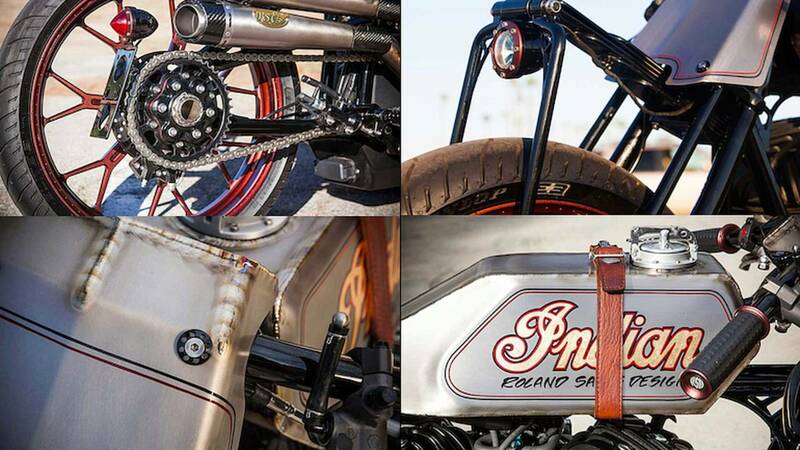 Whether it’s designing gear or motorcycle parts, road racing, flat track, or dirt racing, building custom bikes, or organizing kickass festivals, Sands has it on lock. 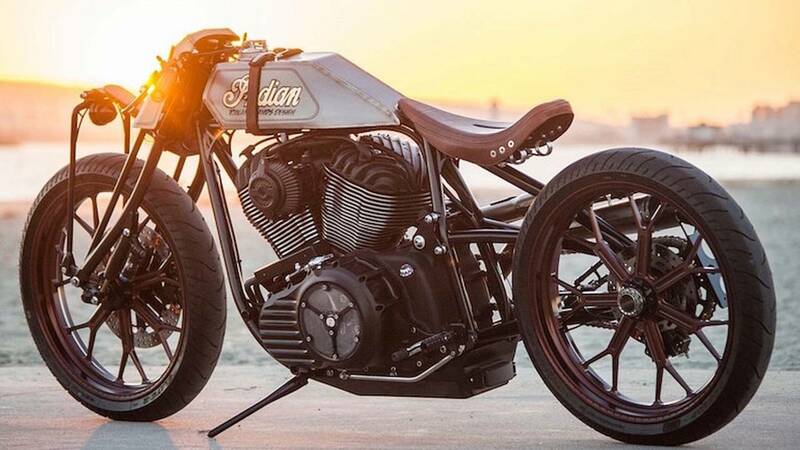 One great example of his work is this heavily modified Indian Chieftain build. Sands thoroughly transformed the machine, reducing a heavy cruiser to a lean, mean, retro track machine. 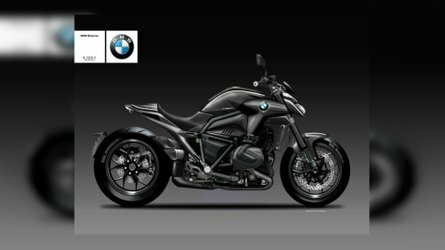 The Track Chief started off as a concept image from digital moto rendering heavyweights Holographic Hammer. Using the drawing, Sands and his team engineered the custom’s geometry, landing on a 3.1” trail. 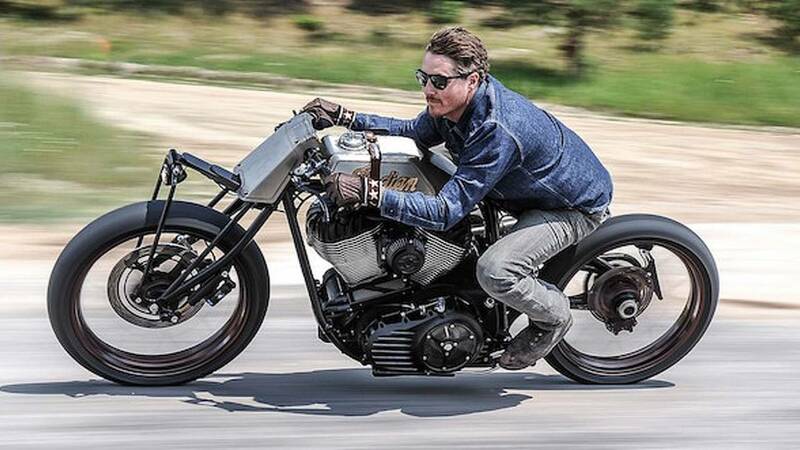 With the machine’s skeletal plans all laid out, the team moved on to tearing down the Indian Chieftain donor, stripping components and panels to get to the engine so the hefty V-Twin could be removed from its stock chassis. Next the frame drawings were put to use, and Sands got to work on churning out a one-off, handmade tubular, chromoly 4130, rigid, single-sided frame, not unlike a typical hardtail, just with a single-sided rear-wheel. With the custom hardtail chassis completed, the team got cracking on the bike’s suspension. A Paughco leaf spring fork unit was bolted to the steel top triple tree using a one-off connection piece, and a FOX DHX mountain bike shock to help soak up road imperfections. Atop the old school forks are a set of clip-on-style handlebars welded to the top triple. This allows for a particularly narrow setup and eliminates the need for risers or pitch bolts. With the frame and suspension complete, the team moved on to the bodywork. They created some mild steel templates before moving on to fabricate the build’s final titanium tank and front number plate. The raw titanium was left exposed, purposefully leaving the the welds and other small imperfections on display. A one-off gas cap was churned out for the project by Crafty B, and a leather strap with stainless steel buckles was added to fasten the fuel-cell to the frame’s top tube. Minimalistic pinstriping adorns the tank and number plate, consisting of dual perimeter stripes in Indian’s classic burgundy and black color combo. 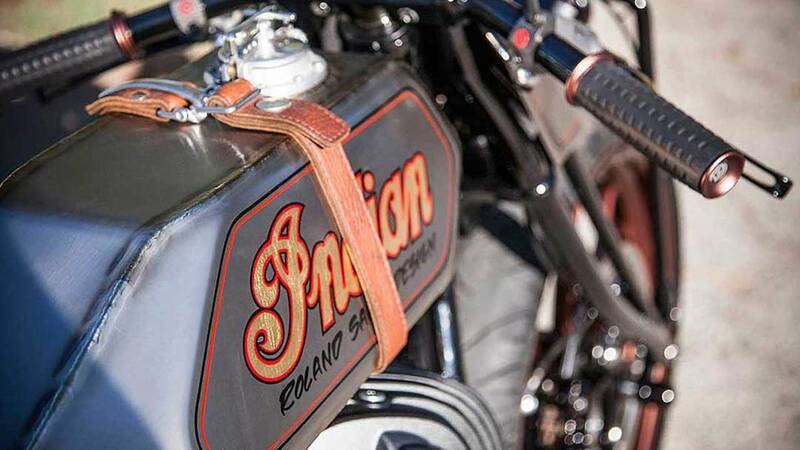 The tank also received a hand painted “Indian” logo with real gold leaf, sitting above a “Roland Sands Design” script. Like pretty much every other element of the build, the seat went through close to a dozen different variations before the team decided on the final saddle. 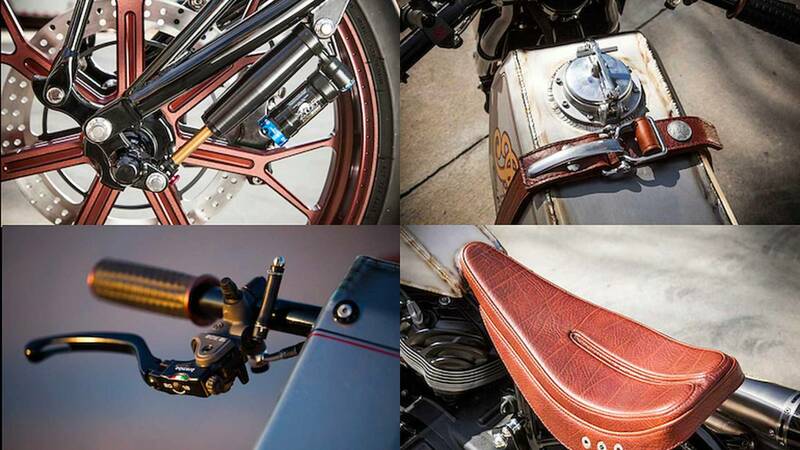 A thin, brown, bull leather seat was produced matching the leather running over the gas tank and furthering the build’s board tracker aesthetic. 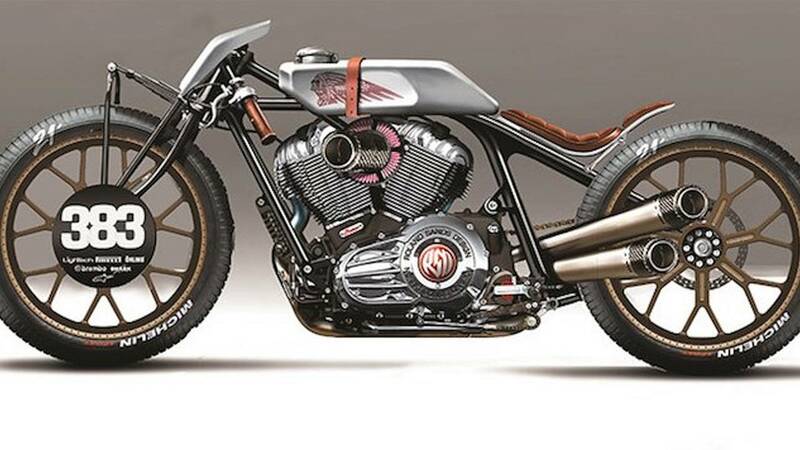 The saddle is one of the few areas where Sands and his team strayed from Holographic Hammer’s original concept rendering, going with a seat that has a more bobber than drag-bike style to it. A set of billet RSD Del Mar wheels and rotors were selected for the project before being fitted with PM Radial brakes—linked to Brembo radial masters—and then wrapped in Dunlop rubber. In back a single-sided rear hub was installed courtesy of Gregg’s Customs. 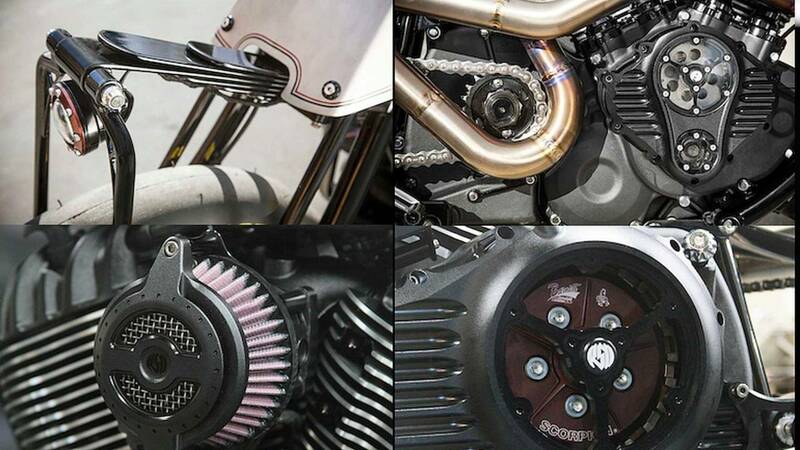 Unsurprisingly there are numerous RSD components found on the Track Chief, including see-through, RSD Clarity cam and primary covers (exposing a Zodiac Sporster clutch slave cylinder), billet RSD Sporster rear-sets mounted via custom “adapters”, RSD Blunt Air Cleaner with K and N filter, RSD grips and bar-ends, RSD screws, bolts and hardware throughout, and an RSD Tracker Tag Bracket in back performs taillight duties while holding the license plate. With the build being inspired by board trackers, there was an immediate need to rid the bike of all its non-vital bits. 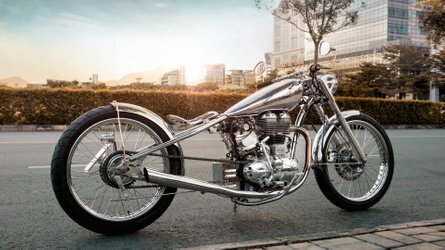 The bike's electronics were hidden through the use of a low-profile belly-pan that also doubles as the housing for the Chieftain’s computer, a Hot Match kickstand, and a custom made, 16 cell, lithium Anti-Gravity battery and wiring harness courtesy of a skunkworks team over at Indian. 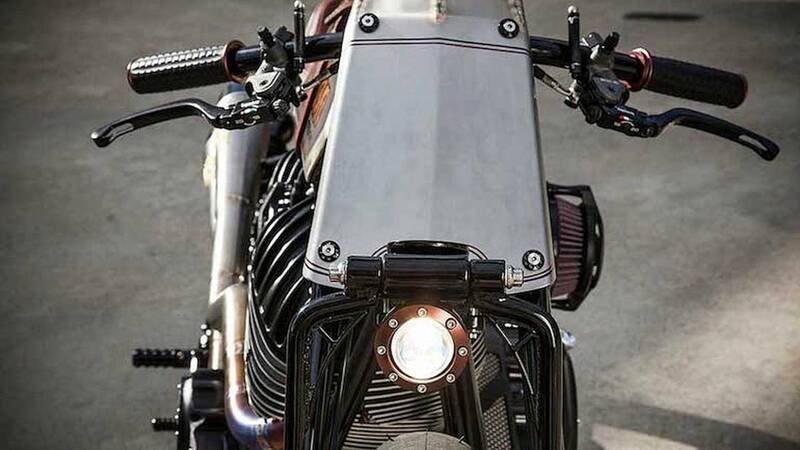 Without room below the engine for the build’s electronic throttle potentiometer, the choice was made to hide the unit—which is now actuated via a cable-operated, internal throttle mechanism—behind the titanium number plate. Below the number plate a PIAA bulb was suspended from the leaf spring unit in custom billet housing, acting as the custom’s primary headlight without ruining the antique race-bike visual theme. The bike is reportedly completely street-legal too, though the team did a great job with making the lighting and whatnot blend into the build. Next came the exhaust, a one-off unit made from bent titanium tubing. 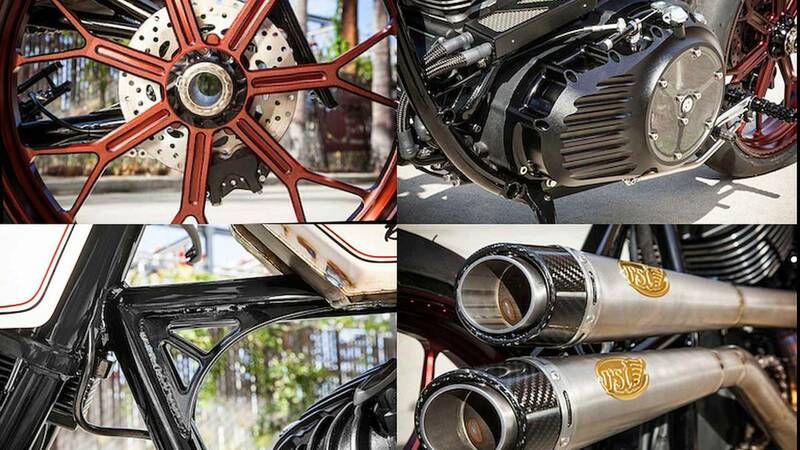 The pipes feed into dual RSD mufflers complete with carbon fiber end-caps and carbon fiber heat guards. I also like how the exhaust is mounted on the bike’s right side so the single-sided wheel remains on full display when the machine is viewed from the left. Sands didn’t provide any actual figures, but it was conveyed that the completed build’s weight is roughly half that of the stock machine’s. 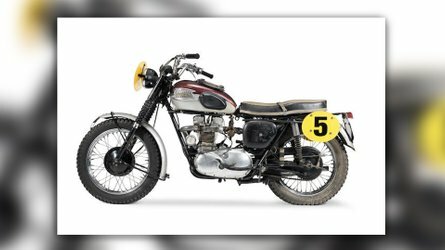 The engine has also received a minor bump in power, though no details were provided beyond saying the V-Twin got “a few extra ponies”. 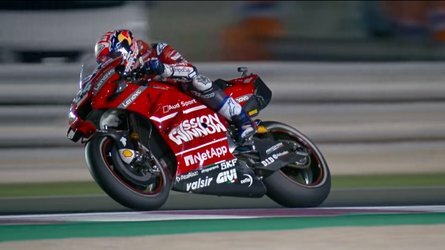 According to Sands the finished bike performs better than one might expect, considering the lack of suspension and the weight of the engine. That said, I imagine Sands is a far more capable rider than the vast majority of us, so maybe take his review with a grain of salt. Either way, the team at RSD did an amazing job on this one. From the outside looking in, all that can really be seen is the frame, engine, wheels, seat, forks, and tank, which is exactly what the bike’s makers were aiming for. The blending of old and new was done tastefully, and the final product looks complete and has an air of originality to it—something that can’t be said for the majority of custom cruisers. 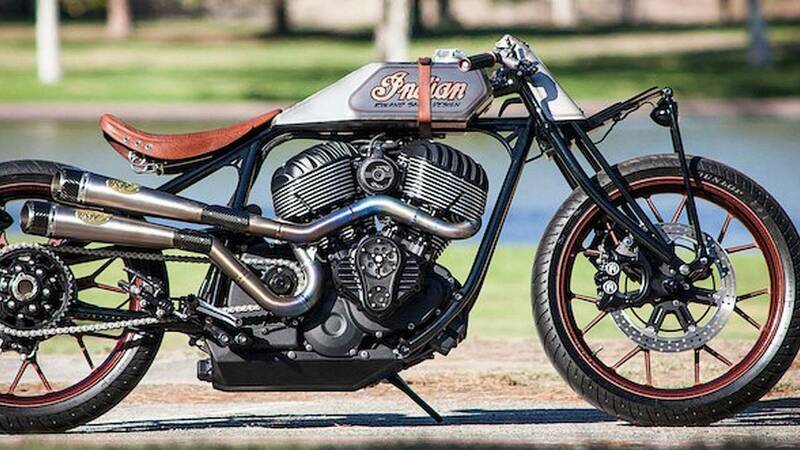 For all these reasons, Roland Sands’ Indian Chieftain-based “Track Chief” is this week’s Bike of the Week. 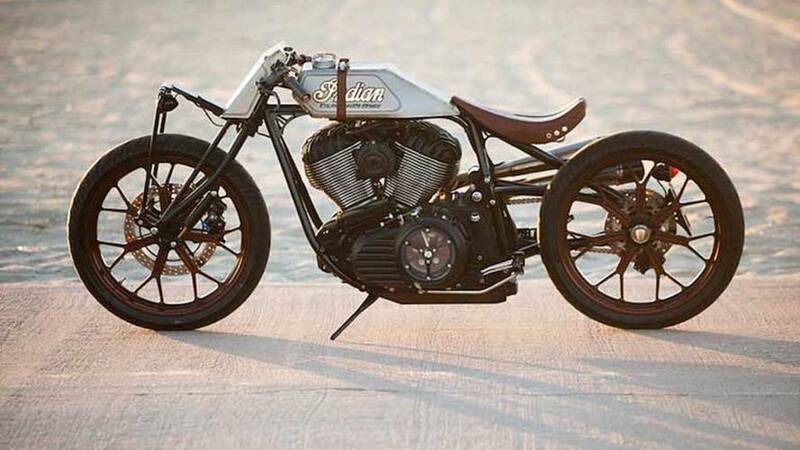 Got a bike you think deserves to be RideApart’s next Bike of the Week? 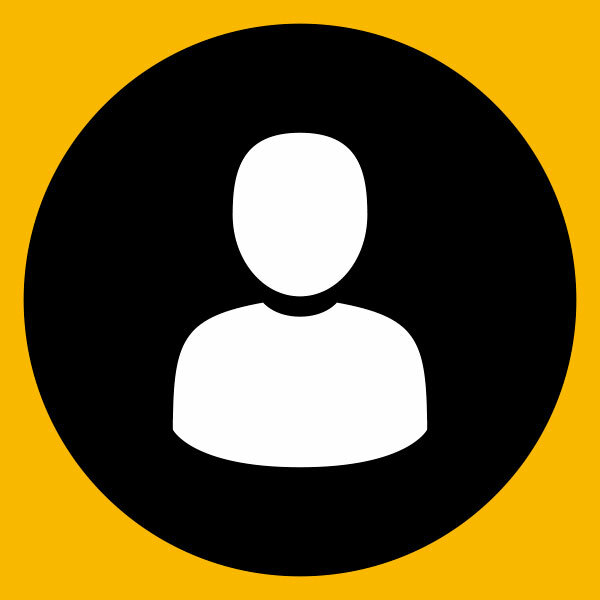 Drop us a line at info@rideapart.com.